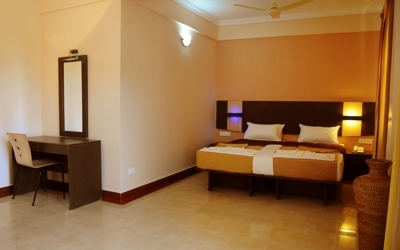 We have spacious and well appointed rooms having split A/c which make your stay comfortable and noise free. The interiors are painstakingly planned for each room with accent on locally available materials traditional workmanship and comfort. We have 24hrs room service to meet your gourmet needs. The hospitality is the characteristic of our room service staff, courteous service and food experience leaves a customer much more than satisfied.